It takes more than just good wine to truly savour this type of beverage, but also a high-quality, beautiful drinking glass as well. Traditional wine glasses are classy yet vulnerable to breakages, especially when you have active kids who like to run around knocking over everything. Acrylic is a molded plastic with great clarity and transparency. Not only is it shatterproof, this material won’t turn yellow and is weather-resistant, which makes acrylic drinking glasses a great alternative to crystal ones. 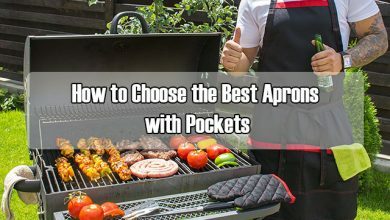 Navigating yourself through the numerous different styles and designs is definitely a tough challenge. With that in mind, here’s a review of my personal favorite acrylic wine glasses for you to choose from. Made for clumsy wine drinkers, this is a durable and resilient cup that is virtually leak-proof. Thanks to the closing lid which provides a tight seal to prevent any leakage, you can now drink your wine without fearing of accidentally spilling on your carpet or white tablecloth. There might be a few dribbled drops here and there, but that’s much better than half a glass full of wine. The double-wall design will keep your beverage nice and cool. Although the glass is claimed to be dishwasher safe, I would suggest washing the item by hand to avoid any undesirable changes to the glass. 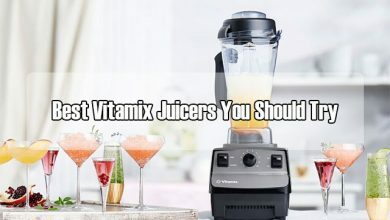 In terms of appearance, the product looks unique and original. The wine glass within the tumbler design looks fancy enough to provide the same satisfaction compared to drinking with a traditional one. Your drink will look cool floating mid-air like with a wine glass. One downside, however, is that these are possibly made for wine alone, since they are rather small in size. 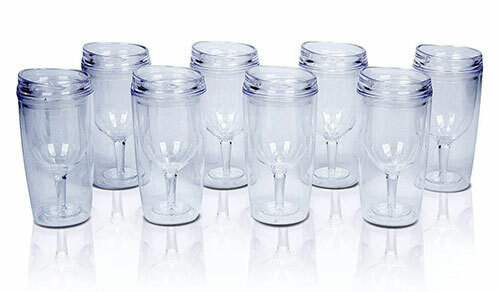 The whole set includes 8 clear glasses, which are perfect for creating your own custom design. These will be a wonderful addition while lounging on the beach or by the pool, sipping some martini. Parks, picnics and backyard BBQs with friends will me much more fun with some chilled wine as well. Feel free to take a look at the review of the best acrylic martini glasses to better your martini experience. Although this is not glass or crystal, this acrylic Jubille Wine Glass actually looks like real glass. They’re neither thick and bulky nor flimsy, and above all, they’re nearly unbreakable. The size of the glass is also nice and not so big that they topple over easily like many plastic wine glasses out there. One problem with some acrylic glasses is that they start showing scratches and wear after a few uses. 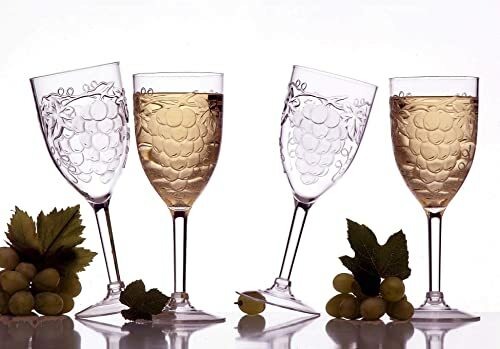 With the embossed grape and vine pattern on these Jubilee glasses, the surface can stand up to repeated use and still remain as new, not to mention looking 10 times more attractive. One caution is that it does say the product is top-shelf dishwasher safe, but I would recommend handwashing the glass since its appearance might be affected by the heat. Nevertheless, cleaning is much easier than expected using a soft cloth. Whether it’s for using by the pool, hot tub, around the camp fire or on the back deck, this acrylic glass will look amazing as well as keeping your wine a bit cooler than a crystal glass does. To maximize the effect, you can keep the glass in the freezer beforehand so that your wine stays chilled while drinking. Overall, this is a nicely sized and attractive wine glass for outdoors. Highly recommended! Tired of the same old wine glass design? Then this Acrylic Rainbow Color Diamond Cut Wine Glass from My Table Talk might catch your attention. The glass is 8 ¼ inches tall and is capable of holding 15 oz, which is a lot of wine. The shape is rather unconventional for a wine drinking glass, and the prisms create absolutely beautiful colors. The diamond cut effect further add to its originality and uniqueness. Everytime I use them, someone would ask where I got such a beautiful and fun looking wine glass from. One important notice is not to put the glass in the dishwasher as the color will peel off. Although this is outlined in the product description, many fail to pay attention to the warning. 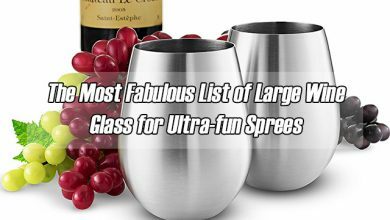 If you’re looking for an acrylic wine glass and feeling a bit adventurous, I think you will fall in love with this product from the first look. Furthermore, the glass comes in a set of 4 and will make a special present that stands out from the rest. These will make a great decoration for party themes as well! Here’s another suggestion for an out-of-the-ordinary acrylic glass from the same manufacturer- My table Talk. This glass is 8 inches tall and can hold a large amount of liquid – up to 14 ounces. The acrylic material used to make this item is high quality and durable, capable of withstanding the wear and tear of daily use without breaking. 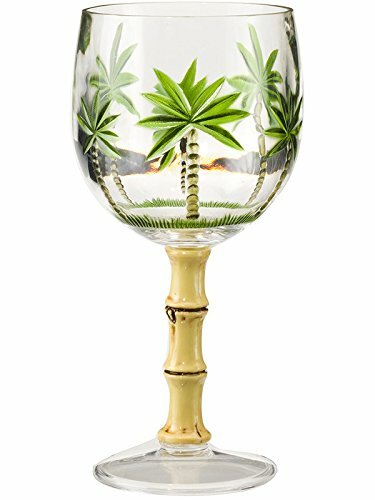 This time, the glass chooses a festive theme with some palm tree and tropical decorations. What makes this product really stands out is actually the bamboo stem design, which is absolutely creative and goes well with the overall theme. However, the stem seems to be glued onto the bowl which, as a result, has a tendency to break off rather easily. Just like what I have stated with the previous product, you should not place these delicate glasses into the dishwasher if you wish to extend its life span. This acrylic wine glass will be ideal for chilling by the pool or as a theme party decoration. Looking at it, doesn’t it make you wish you were lounging on the beach, sipping you favorite wine? 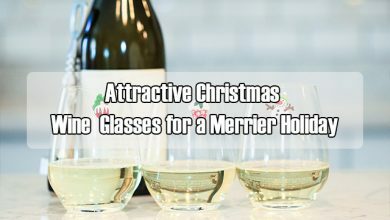 The package includes 4 lovely stemless wine glasses. Although made from BPA-free acrylic, they still have a feel of real glass unlike the plastic ones that can be found at discount stores. The glass is neither too think or thick, and is lightweight enough to be held comfortably in your hand. These cups are also very durable and can withstand several drops with no cracks or chips. 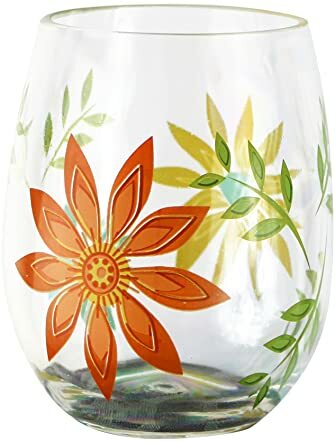 Besides its durability, the glass looks pretty with the colorful flowers and vines. I think drinking wine may even be more enjoyable and tastier in a beautiful and fun glass. There have been mixed opinions on whether the glass is dishwasher safe or not. Some complain that dishwashing makes them opaque and doesn’t come out clear anymore. In my case, however, I haven’t experienced any cloudiness, fading, peeling or chipping of the patter from going through the dishwasher many times. Still, for the sake of keeping the glass in perfect shape, my advice is to handwash these cups, which won’t take much of your time. Something that I find troublesome with this product is that a continuous ridge similar to a “lip” around the bottom. When you run them through the dishwasher, water tends to collect there and requires some extra effort to be dumped and hand-dried before putting away. Other than that, I am quite pleased with this purchase. This is a set of 4 gorgeous 14 oz acrylic stemless wine glass that is sure to captivate you at the first look. 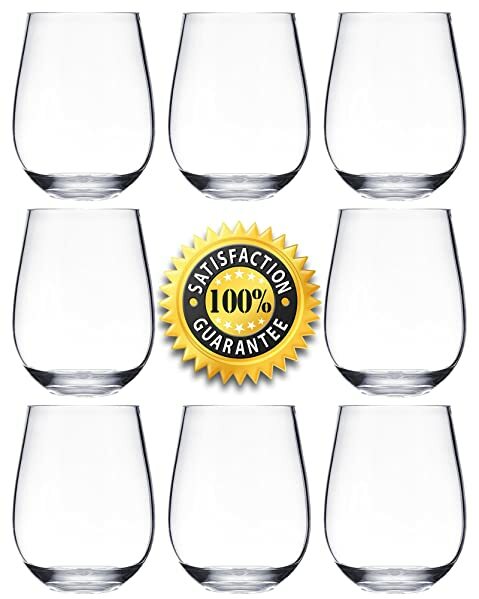 For a list of the best stemless wine glass, feel free to check this review. The glass has a nice weight and feels substantial. The material is good quality acrylic which is very clear and elegant for plastic. However, I can’t stress enough the importance of handwashing these glasses instead of using a dishwasher. The heat tends to create cracks and causes the color to melt to the bottom, losing some of its beauty. Once they are washed, dry them with a paper towel to maintain their shine and prevent water spot. I would also advice against putting the glass in the freezer with ¼ of the glass filled with water, as it might break. What makes this glass truly wonderful is its luminous colors, which reflect a rainbow effect when filled. There’s just something about the burst of colors that makes them so enjoyable, and the colors seem to dance right before our eyes. Especially when there is a clear liquid in them, the color magnifies the effect and the result is simply mesmerizing. 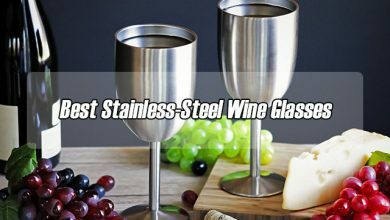 These acrylic wine glasses will be nice for summer cocktails and will be a hit at parties, guaranteed to earn a great deal of compliments from your friends and guests. 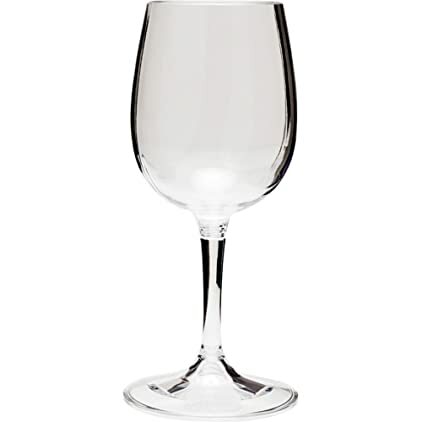 This Notmog wine glass distincts itself from other regular plastic glasses thanks to its outstanding quality. Made from BPA-free food-grade copolyester plastic, this glass is sturdy and hard to break, so you will no longer have to worry about your seniors or children dropping one. The glass adopts a simple, no frills design which is perfect for personal customizing to add a bit of your personality to it. 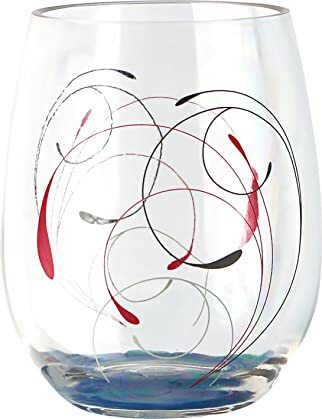 Moreover, unlike those cheap thin plastic glasses that melt or lose colors in the dishwasher, this Notmog acrylic wine glass still looks amazing no matter how many times you put it in the dishwashing machine. There are up to 8 glasses in each package, enough for the whole family and is perfect for serving wine, juicers, water, you name it. This will make a wonderful gift for a wedding, anniversary or house-warming party. Sometimes simple is much better, don’t you think? Yet another product in the Corelle Coordinates brand from Reston Lloyd. Just like its other wine glass mentioned earlier, this product is much thicker compared to many other types of glasses, despite being made from plastic. As a result, the glass looks and feels much more expensive and high-quality. And the swirl patterns further compliment and definitely add to its elegance. Plus, the color of the pattern is still as pristine as day one after extensive use. One thing seemingly in common among acrylic wine glasses is not being dishwasher-safe, despite the manufacturer’s claim to be. The glasses are prone to cracking and discoloring unless hand-washed. If I must complain about one thing, it would be the fact that these glasses are quite easily scratched, and sometimes cracks without being subjected to trauma or extreme temperatures. Should you any defects with your product upon arrival, rest assured that the company is very professional and helpful in replacing your faulty glasses. Want to travel while still being able to enjoy your favorite vintage? Here’s the solution for you. 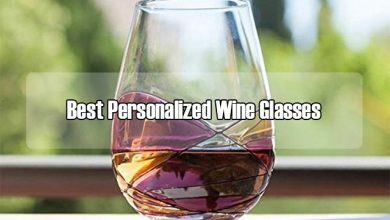 The glass can hold up to 10 oz and is made of quality plastic material that has a good weight an feel for a plastic wine cup. The design as well as the shape is quite simple and minimal, which gives off a traditional, elegant aura of a real crystal wine glass. One feature which I considered pretty brilliant is the nesting design, in which the base can be unscrewed or snapped into the cup for efficient packing and storing. If you have been through the struggle of having to figuring out a way to pack the fragile, bulky crystal wine glasses everytime you travel, you’ll understand why I appreciate this feature so much. This acrylic wine glass will be a staple in the luggage of the travelholics, since it takes little room and are durable enough to withstand a certain level of impacts. Furthermore, this wine glass is easy to clean and light enough to carry around. You can now bring your own wine and favorite snack to enjoy your trip to its fullest. 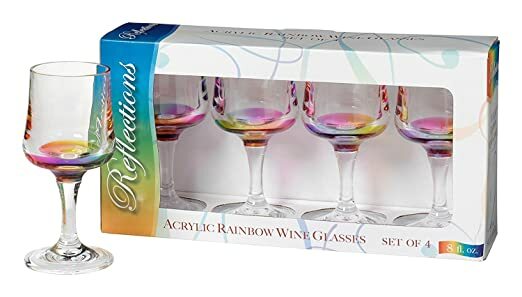 Another beautiful rainbow wine glass to add to your collection! The glass is 6 7/8 inches tall has a maximum capacity of 8 oz, and the weight is just perfect in your hand. The cup is so clear that it looks just like real glass, while at the same time avoids risks of shattered crystal if accidentally dropped. Also, the base of the stem is pretty, which prevents the glass from toppling over and spilling. Not only is it shatterproof, the glass looks amazing as well with its beautiful rainbow effect at the bottom. The colors are luminous, making it seems as if there were rainbow reflections radiating from the glass itself. I have received many compliments from others on how nice the glass look and their surprised reaction when people learn that it is actually acrylic. There are 4 glasses per package and will be stylish enough for inside use and durable enough for the pool and patio as well. Again, remember to handwash only in order to keep the glasses clear. Other than that, these are attractive glasses that is definitely worth taking into account. 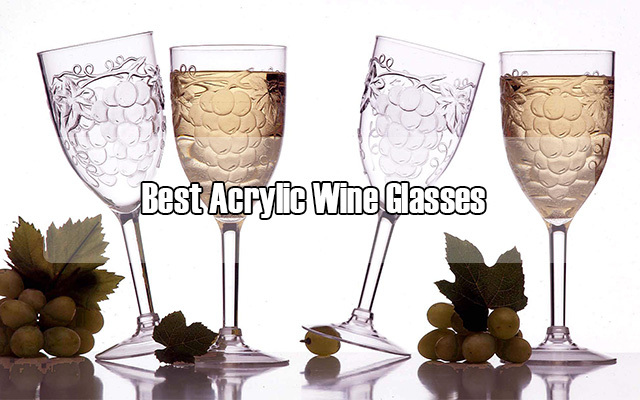 Choosing the right acrylic wine glass that fits the bill is no means feat. I hope that the review above can somehow help you in making the right decision.